The video subtitle editor is only available on the Growth plan and up. For the video player to work, timestamps should be included with your subtitle file. From the project navigation, select the project with the file you want to link your video to. From the list of resources, click on the file you want to link the video to. Open the Options by clicking the icon (indicated by three dots) in the top-right corner of the page. 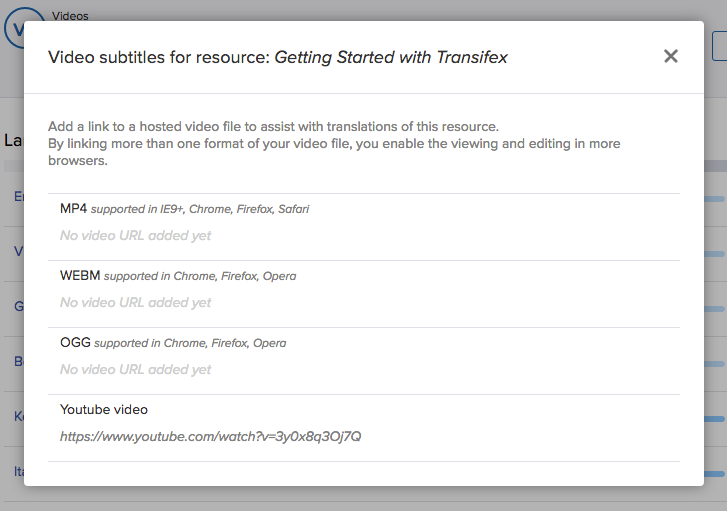 When open, click "Video subtitles"
In the popup, add the URL of the video to the field matching your video's format. You can add separate URLs for the same video (e.g. www.example.com/video.mp4 and www.example.com/video.webm) if you'd like the video to work in different browsers. Your video can be hosted on YouTube, Amazon S3, or any other 3rd party site as long as it's publicly accessible. 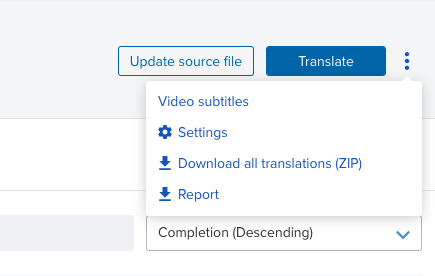 Once you've associated a video with the file, you can use the video player as you translate subtitles.